Vert Is Dead: Jesse Paez #4. I had a pair of these. Mine were in all white and were the last pair of white shoes I've ever owned. For some reason, I do not like how solid white sneakers look. I feel this color scheme does look pretty decent. My personal color crisis aside, the Mercurys were built like a tank. The soles were thick, probably too thick, and they never broke in quite right. I also think the shoes ran a tad small and didn't fit properly, which didn't help matters any. I eventually gave them away to a friend who had smaller feet and he dug 'em. Dave Swift took the photo. 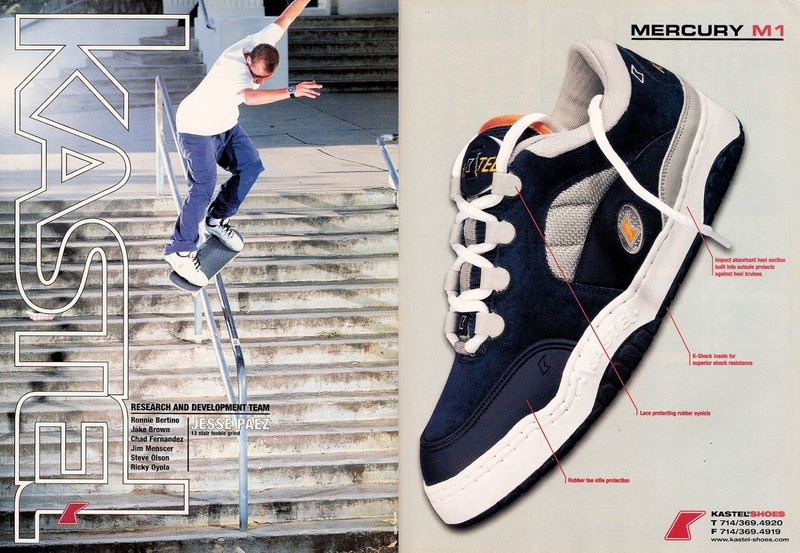 Last pair of all-white shoes I had were the Jamie Thomas emericas. Kastel is a reminder how much branding and logos mean. Could be a great product but never dug the logo. Shallow i know, but I'm in marketing. As Pat Canale used to write, KastelShoeCoUSA. I get that. I'm not fully sure what I think of Kastel. The skate photos they used were nearly always good and they had a solid team. The ads were sporty, but not in quite the same way as DC. I like that the ads were more colorful for some reason in looking back on them. DC next week for comparison purposes.